Two features in El Capitan can help people with limited vision: First, you can change the display resolution and brightness on your Mac so that onscreen elements are easier to distinguish. Second, you can use the Accessibility Display tools to enhance the clarity of your Desktop, Finder windows, and program windows. 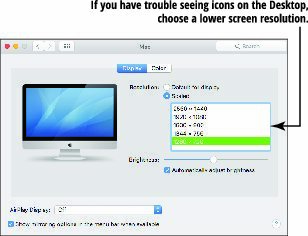 Your monitor can display different resolutions, and the higher the resolution, the smaller that items appear onscreen. So if you want items on the Desktop to appear larger, you have to lower the screen resolution. You can also change the brightness level of your display to match the ambient lighting in the room. Open System Preferences, and click the Display icon to display the settings below. Click the Scaled radio button; then click the resolution you want to use in the list that appears. If you’re having problems discerning items on the Desktop, try a lower resolution. (Optional) By default, El Capitan sets the brightness of your screen automatically based on the ambient lighting around your Mac. If you’d like to specify a brightness level yourself, click the Automatically Adjust Brightness check box and drag the Brightness slider to the desired level. Press ⌘+Q to close System Preferences and save your changes.